In between construction chores yesterday, I hopped online to check email and such, and well… how can you not check eBay as well. 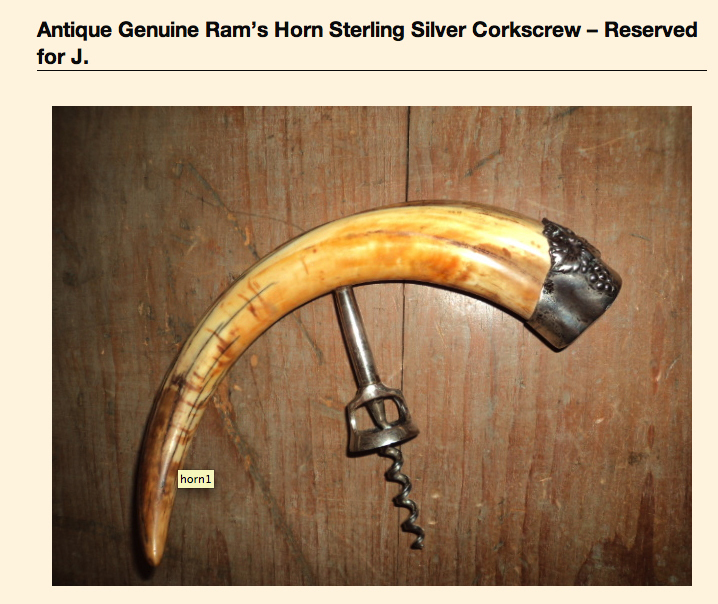 And, what should I find but an interesting corkscrew with a buy it now option. 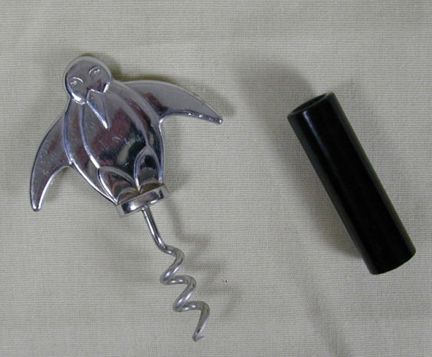 I hesitated for a moment, as the first image looked as if the corkscrew was missing an important part–the little sheath. 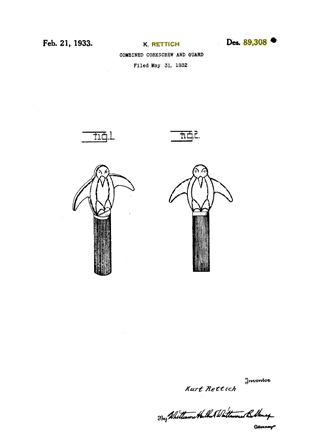 However, after looking at the additional images, the Rettich patent Penguin Corkscrew is complete! And, so a penguin is heading to the island. Given the amount of snow this last year, he should be quite comfortable. 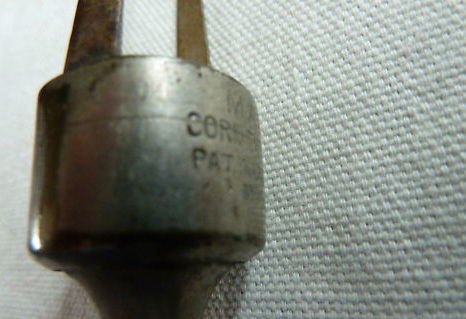 I was on to my second cup of coffee this morning, when I hit a bookmarked search which peruses the usual non-ebay e-haunts where a corkscrew might be hiding, and what should come up, but a person’s blog which mentioned a corkscrew. 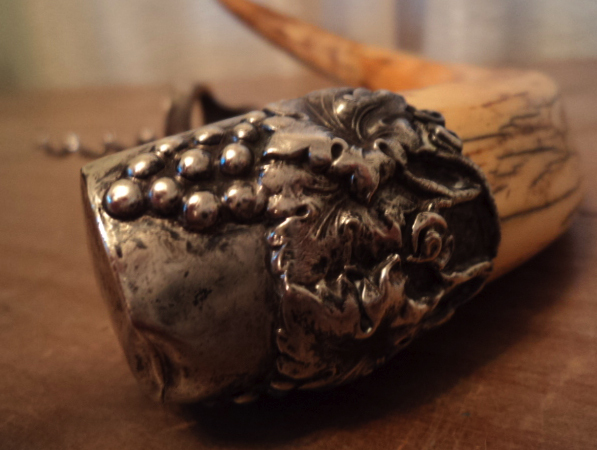 After clicking the link, a nice sterling adorned tusk corkscrew came up. Nothing truly rare, but a handsome piece at a VERY good price. I wonder if she will change to “Sold to J” after I paypal her the money? We are closing in on moving to the new house, and today I put together the corkscrew case. After much deliberation and consideration, its new home is to the right of the woodstove in the livingroom. So, one can warm themselves, stare out at the harbor, whilst picking a corkscrew out with which to open a bottle of wine. (wouldn’t it be cool, if they didn’t measure up TC?). And, while I didn’t add two to the collection, I did add one, as the Tucker arrived today on the island, and it should make the best 6 for 2011. We are still early in the corkscrew fiscal year to be choosing, but at this point, I believe the Chinnock variant with square opening and the Tucker will ultimately make the cut. On a house construction note, we actually started moving in! I have some small touch ups to do, and a little paint on the trim, but construction–minus the kitchen–will be complete by Monday! Then, early on next week the cabinetry should be complete. There were moments where I didn’t think we would make the April 1 deadline, but it looks like we should be living there within a few days! 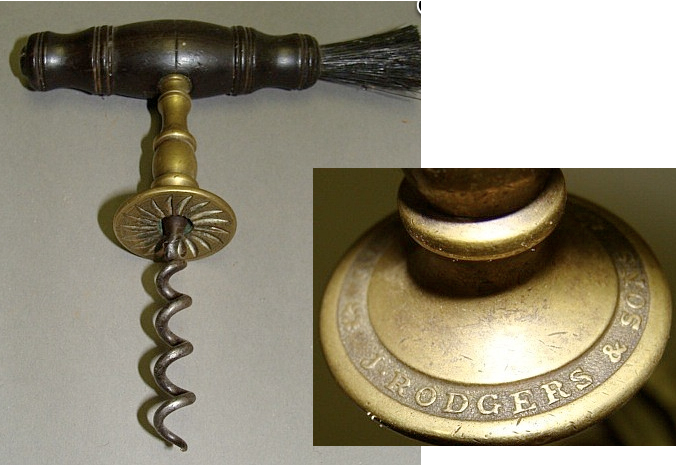 Last week a Tucker was listed on eBay with a detailed description that included a reference to an ICCAuction where the Tucker patent corkscrew sold for over 1800 dollars. And, the seller, decided on what they felt was an appropriate reserve, and let the auction run. At some point during the week, the seller reduced the reserve price. And, this afternoon, knowing that the corkscrew listing was ending, I checked the price. 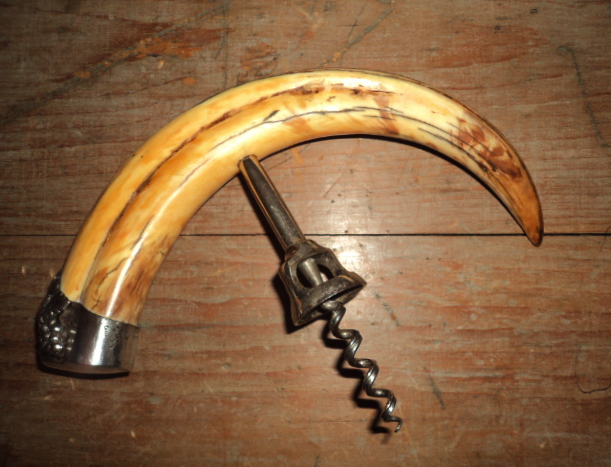 Significantly less than what the corkscrew on the ICCAuction sold for, and still not hitting the reserve. So, I threw a bid on the Tucker, and lo behold it met the reserve. However, my bid was exactly the reserve price, and any further bidding would have taken it. I headed back to the house/construction site, and figured that the corkscrew would come close to the ICCAuction sales price. After a bit of spackling, caulking, and getting ready for final coats of paint, I picked up my iPhone to see that I won. How is that even possible, I said aloud. A Tucker… Really? Why or how, I guess is unimportant. What is important, is there will be a lovely Tucker patent heading to the collection. On a side note, PB emailed after the auction ended to explain that he had a snipe bid set, but the seller’s USA only shipping blocked the snipe from going through. We are closing in on moving to the new house, so much of my time–all of my time–is being spent finishing up construction work on our new home. We are really really close to finishing, and actually have our phone and internet being hooked up at 65 Atlantic on the 28th. Blogs, emails, and any bidding on eBay might be delayed that day. 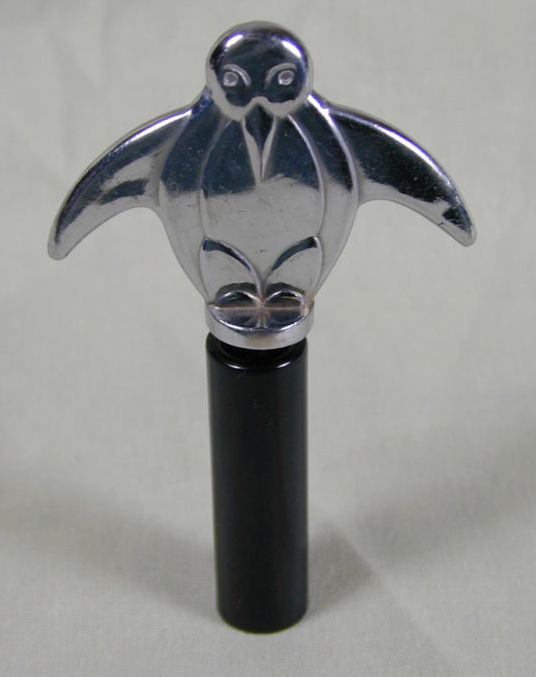 That said, the corkscrews from the auction mentioned the other day arrived. And, as hoped, several of the corkscrews were indeed marked. The direct pull with blade, is marked H & B MFG, which stands for Humason and Beckley. The Curley is marked with its patent information and Troy, NY. I believe bell is a little different than my other Curleys, and will have to check that out. The J. Rodgers, is of course marked, J. Rodgers & Son, Sheffield. And, the double folder is unmarked. As I suspected, but hoped otherwise. After showing them to the lovely bride, she laid claim to the double folder….. The Mumford Patent Cork Extractor mentioned the other day, arrived recently, and it is pretty fabulous. As we are getting ready to move into the new house, I can’t compare this Mumford with my other Mumford as the corkscrews are packed up, but it seems to me that this is a double. So, if anyone is interested in making a swap for it, just drop me a line. 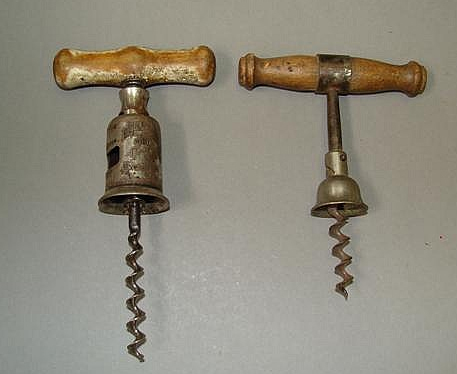 Yes, I am aware that St. Patrick’s Day was yesterday, but as it happened there was a corkscrew auction in PA yesterday, and I managed to come away with a couple lots. And, so indeed it was a Happy Corkscrewy St. Patrick’s Day!!! 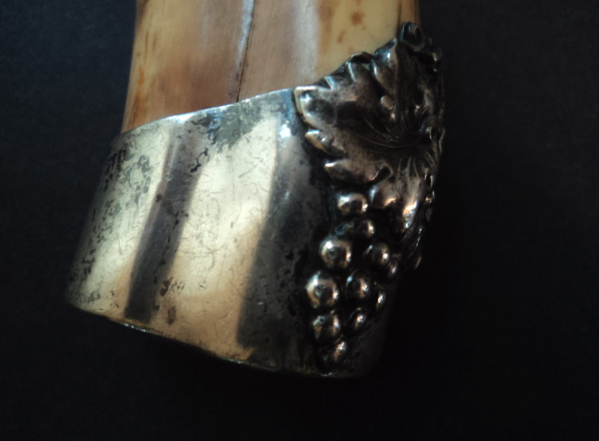 I had hoped to win a couple of other corkscrews as well, but between my internet connection, and the bidding live button, I did miss out on a couple of others; a four pillar, and a silver picnic. On the four pillar, I had lost connection, so I couldn’t do much about it. On the silver picnic, I actually clicked the bid button, but the item ended while my bid read pending. That one kind of hurt, as the corkscrew sold for all of about 90 dollars. A direct pull with blade. 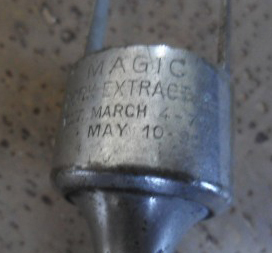 I am hoping this is marked. 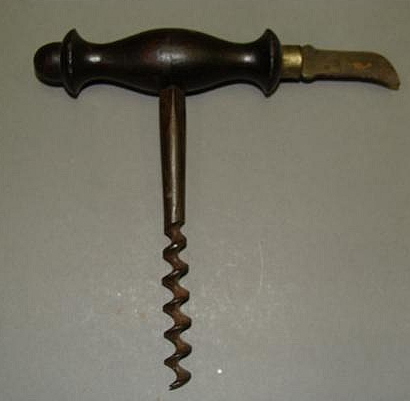 A two corkscrew lot, that looks to include a Curley–again, no mention of markings, but still a nice corkscrew. A signed J. Rodgers & Son Henshall. 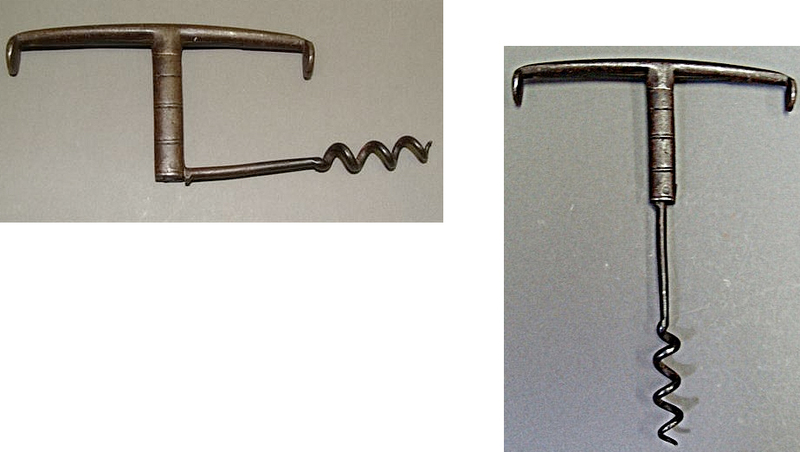 And, lastly a double hinged folding corkscrew with pipe tamper ends. On a construction note, I did install the wood stove, the cabinets in the kitchen are in the beginning stages, and we are almost completely finished with the trim. And,, if all goes as planned, the guest room and office upstairs will be ready by the end of the weekend! 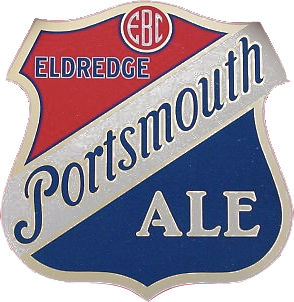 The other day, I managed to win (on eBay) a Williamson Roundlet corkscrew with an advertising plate for Eldridge Brewing — out of Portsmouth, NH. Speaking of stepping up to the plate, baseball season is only 14 days 7 hours away! Go Giants!!! As far as the construction goes. We have trimmed out most of the first floor–and should be finished tomorrow. And, the bases for the kitchen cabinets should be going in soon. Also, the zinc (yes zinc) has been ordered for the countertops and will be arriving mid next week. We will be moving in really soon! Yesterday, the lovely went for a run, while I was doing some construction chores. And, as I had finished up, I meandered over to where the laptop was sitting, and decided to check email, ebay, and the like. And, as eBay came up, I had to look twice. 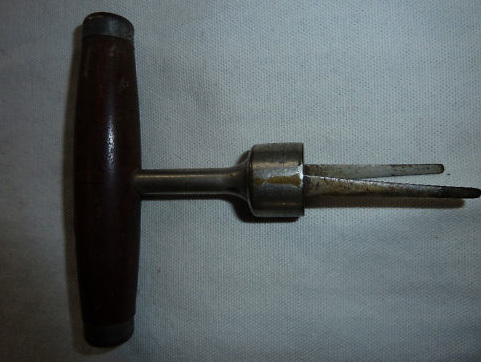 A nice 1892 American Patent cork puller with a buy it now price of $ 10.99. I looked closely at the listing, and clicked the buy it now. Actually, I couldn’t do it fast enough, as I knew those of you reading this would have snapped it up had you seen it. After the item was secured, I went back to examine the pictures. 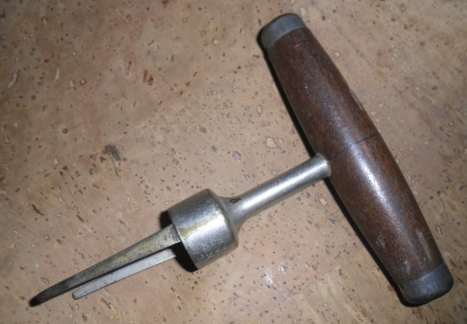 The photos aren’t that good, but the cork puller looks to be complete, with no damage that I could see. And, even if it had a bit of damage–at 11 dollars, it was still a fantastic deal.